After years of abuses by the Colorado Fuel & Mining Company (CFI), thousands of miners throughout the southern Colorado coalfields joined a United Mine Workers of America (UMWA) strike. The ensuing violence from September 1913 to May 1914 made it the bloodiest labor dispute in American history. 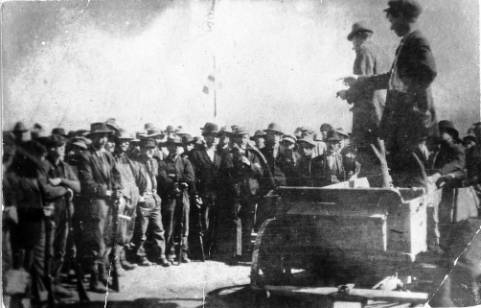 Animosity between union organizers and mining operators hit a boiling point in August 1913 after the callous murder of union organizer Gerald Lippiatt by mine guards. The Colorado Fuel & Mining Company (CFI) did not acknowledge the murder and local authorities refused to investigate. Angered by their inaction, the United Mine Workers of America (UMWA) District 15 gathered at Trinidad to declare a strike on September 16. The union demanded recognition, a ten percent wage increase, enforcement of eight-hour workday laws, checkweighmen to verify the payment per ton of coal, payment in cash, freedom to buy and sell, and enforcement of all other mining laws. When their demands were announced on September 23, retribution was swift. Before the day was out, all miners and their families had been evicted from company housing and left without means to buy food and other goods. To aid them, the UMWA provided half a dozen tent colonies, the largest of which were at Aguilar and Ludlow. For a month, spurts of violence interrupted the lull in negotiations. The Baldwin-Felts Agency, anti-union mercenaries employed by the mining operators, sent in strikebreakers from West Virginia to harass the strikers and break the union. The detectives drove around in machine-gun equipped cars and assaulted the Forbes tent colony, killing a striker and a small boy. However, the strikers were not guiltless either. They continually harassed non-union miners (“scabs”) who continued to work, threatening them and their families if they refused to join the strike. Civil conditions rapidly deteriorated in the region, culminating in the murder of company guard John Nimmo. It was at that moment that CFI president L.M. Bowers begged Colorado Governor Elias Ammons to send in the National Guard to restore order. Governor Ammons declared martial law in the coalfields, and militiamen under the command of General John Chase arrived in late October. Their arrival, however, only intensified the violence. An official government report described the militiamen as the “very scum of humanity” for their unwarranted assaults on women, children, and enslavement of captured strikers. General Chase vehemently denied those accusations, insisting that the actions of the National Guard were legal necessities to prevent unnecessary loss of life. By the time the strike ended in May 1914, an estimated 150–200 people had been killed or severely maimed. Forbes, Colo. -- Correspondents under Flag of Truce: The strike was widely covered in national newspapers. In this photograph, correspondents attempt to travel between the Forbes tent colony and another destination. White flags were not always respected by the militia, who would often shoot at unsuspecting travelers. ~ Source: Bains News Service, from the Library of Congress. 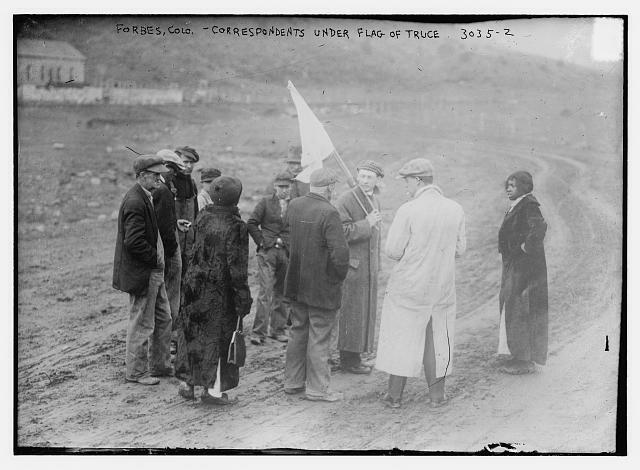 “Forbes, Colo. -- Correspondents under Flag of Truce,” available at http://www.loc.gov/pictures/item/2014695835/. Lt. J.K. Hume -- Lt. J.P. Wheeler -- Capt. E. Portner -- Capt. G. P. Rodney -- Capt. T.D. 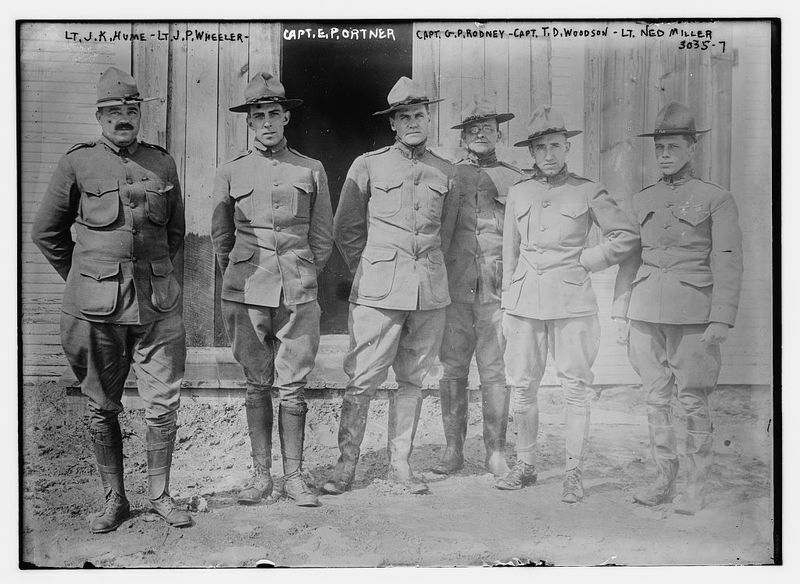 Woodson -- Lt. Ned Miller: Colorado militiamen pose for a photograph in early 1914. They arrived in October 1913 after the murder of mine guard John Nimmo. ~ Source: Bains News Service, from the Library of Congress. “Lt. J.K. Hume -- Lt. J.P. Wheeler -- Capt. E. Portner -- Capt. G. P. Rodney -- Capt. T.D. Woodson -- Lt. Ned Miller.” available at http://www.loc.gov/pictures/item/2014695840/. 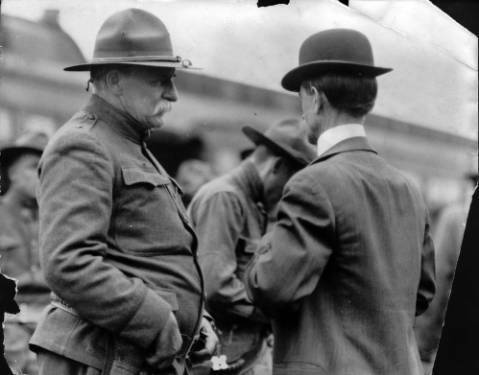 Gen. John Chase: General John Chase (left) was ultimately responsible for the behavior of his troops during the strike. Multiple government inquiries questioned Chase’s role in his soldiers’ abuses, but he was not court-martialed. ~ Source: From Wikimedia Commons. “Gen. John Chase,” available at https://commons.wikimedia.org/w/index.php?curid=45405499. Forbes, Colo. -- Slain Miner & One of His Fighting Comrades: This photograph possibly captures the aftermath of the October 1913 assault of the Forbes tent colony by Baldwin-Felts detectives. At least one mine guard, striker, and young boy were killed in the attack. ~ Source: Bains News Service, from the Library of Congress. 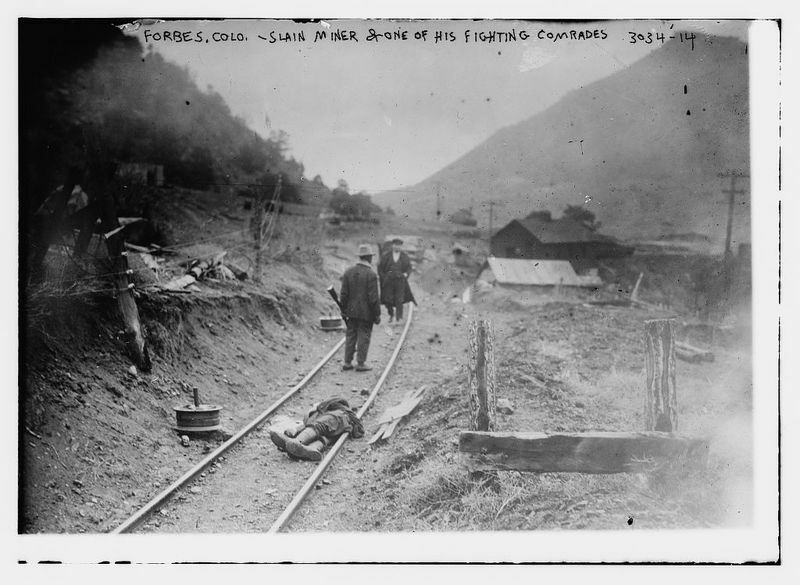 “Forbes, Colo. -- Slain miner & one of his fighting comrades,” available at http://www.loc.gov/pictures/item/2014695831/. Speakers at Ludlow Strike: UMWA labor union organizers address coal miners on strike against CFI in Ludlow, Colorado. United States flags fly over the crowd. ~ Source: Doyle, Ed., from the Denver Public Library Western History Photographic Collections. “Speakers at Ludlow Strike,” available at http://digital.denverlibrary.org/cdm/singleitem/collection/p15330coll22/id/33971/rec/1. Source ID 89.451.4277: An enthusiastic group of strikers poses for a picture in front of the Ludlow tent colony. ~ Source: Dold, from the History Colorado Online Collection. “Source ID 89.451.4277,” available at http://5008.sydneyplus.com/HistoryColorado_ArgusNet_Final/Portal/Portal.aspx?component=BasicSearchResults&record=facca16e-1a75-404a-82df-96a048c85257. 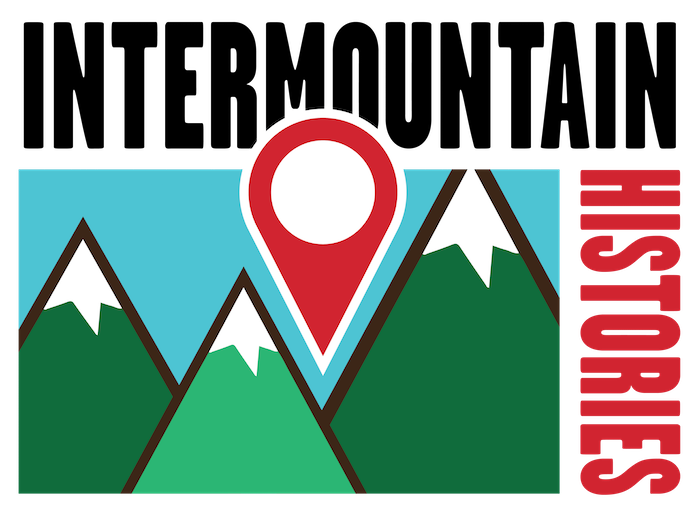 ,” Intermountain Histories, accessed April 20, 2019, https://www.intermountainhistories.org/items/show/219. Boughton, Edward J. The Military Occupation of the Coal Strike Zone of Colorado by the Colorado National Guard 1913–1914. Denver, CO: Smith-Brooks Printing Company, 1914. Johnson, Marilynn S. Introduction to Violence in the West: The Johnson County Range War and the Ludlow Massacre—A Brief History with Documents Boston, MA: Bedford/St. Martin’s, 2009. Livoda, Mike. Interviewed by Harold Black at Denver, CO. 8 November 1968. University of Denver Special Collections Digital Repository. Bessemer Historical Society. Available at https://specialcollections.du.edu/islandora/object/codu%3A99657. Martelle, Scott. 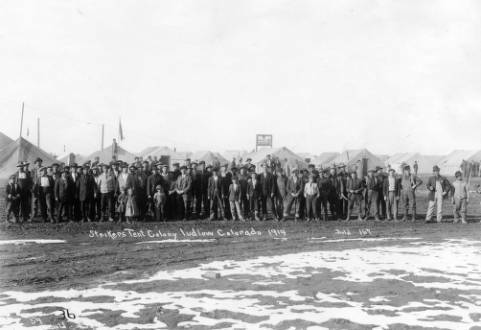 Blood Passion: The Ludlow Massacre and Class War in the American West. New Brunswick, NJ: Rutgers University Press, 2007.